One of the reasons I took so long to getstarted on building a sustainable wardrobe was primarily because of my (wrong)perceptions of people who lived sustainably. The idea of a wardrobe restrictedto Jolna Pais and other items of clothing and accessories that aredepressing to think of, let alone look at, was not one that appealed to me.However, the more I read about the dangers of fast fashion and the ways inwhich beloved brands (including Forever21, H&M, Zara, and the like) wereincreasing pollution, global temperatures and contributing to the world’sgarbage by millions of tons, did I realise that something really had to be doneabout the way I viewed not only shopping, but also my wardrobe. It was when Iactually made an effort to be more conscious about the decisions affecting thetwo did I realise how easy (and cute!) a sustainable, ethical wardrobe couldbe. Here are five things I learned when I made the transition. Buy only what you need - One of the most important commandments(perhaps the only commandment) of having a sustainable wardrobe is to only buywhat you need. You already have three pairs of blue jeans. You don’t needanother. Even if it’s on sale. Please. Put it away. 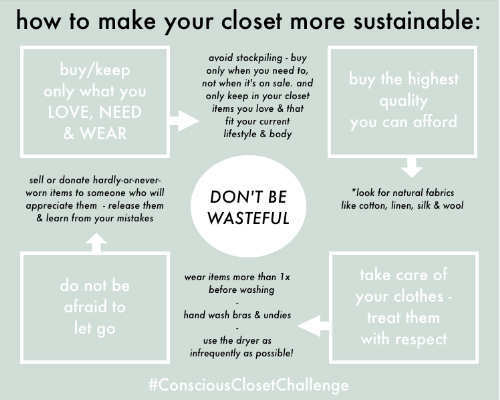 Sustainable is not the same as minimalist- Sure, minimalismis also a great concept, but making your wardrobe sustainable isn’t the samepurging every piece of fast fashion from your wardrobe. I didn’t throw anythingout, but instead decided that I wouldn’t support fast fashion anymore, and thatI would make the best out of what I already had. Sustainability isn’t expensive - I know I just said you’ve to spend moreon better quality clothes, but here’s the thing, well made clothes last so muchlonger that you don’t have to buy replacements every three months, thus savingmoney for you in the long run. Your style should multi-task: Another great thing I learned was to seehow I could wear my existing clothes in different ways. It’s so easy to gettired of a top or a skirt but the moment you start thinking about the differentways you can wear it, you really do see it in a new light. Consider gettinginspiration on Pinterest on different ways you can mix and match a piece ofclothing, and don’t buy anything in the future which you cannot wear at leastthree different ways. Lavanya Mohan is a Chartered Accountant, writer and shopaholic in rehabilitation from Chennai. Her articles have been published in The Hindu, Elle, Architectural Digest, Outlook, among others.